A ping pong machine. That’s what Surya’s little mouth has become. This weekend it’s been a revolving door for whatever she allows in. In. Out. And with force. And bounce. Like the little ball in a ping pong machine. This has led to much hypothesizing by us. She’s teething. She’s tired. She’s going through an independence stage and wants to feed herself. She needs more finger food. She needs to be allowed to play with her food and feel it more. My mother put it simply. Every kid goes through this stage. 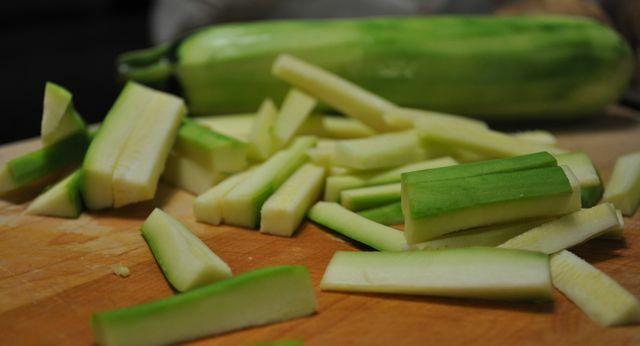 Usually I peel then cube a few zucchinis for her, saute them in olive oil then puree them in my Cuisinart. But since she’s seemed so eager to use her newly developed chompers, I decided to make her deep fried zucchini sticks. It did the trick. Today. Who knows what that little monkey will think about them next time I serve them up. These are great for a new finger food. They are a little slippery from the oil, but Surya was able to get a grip on them. 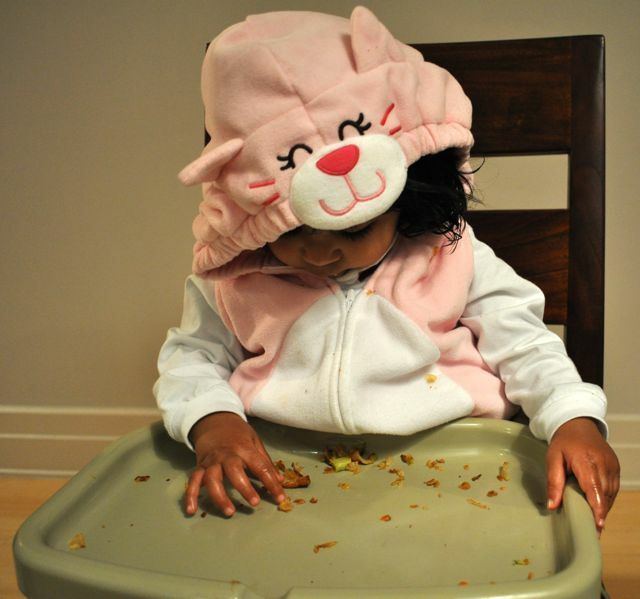 She loved peeling the tempura coat off, playing with the pieces, then shoveling soft bits of zucchini into her mouth. And my mouth. Pour the milk into a bowl. Mix the salt and flour together. 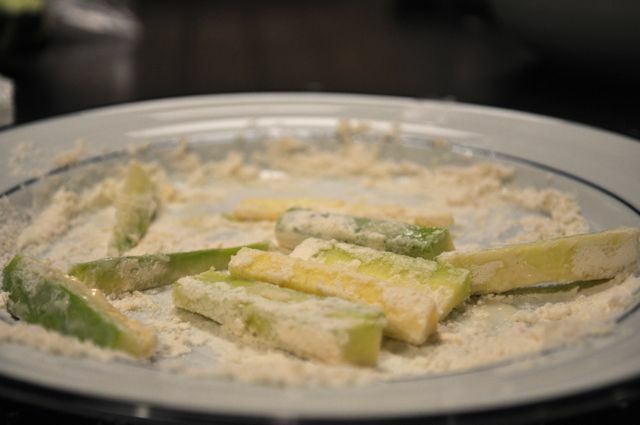 Spread half of the flour on a small plate. Drop the zucchini sticks in the milk. Then roll them around in the flour. Shake off the excess flour. In a deep skillet, heat about 3 tablespoons of oil on medium heat. 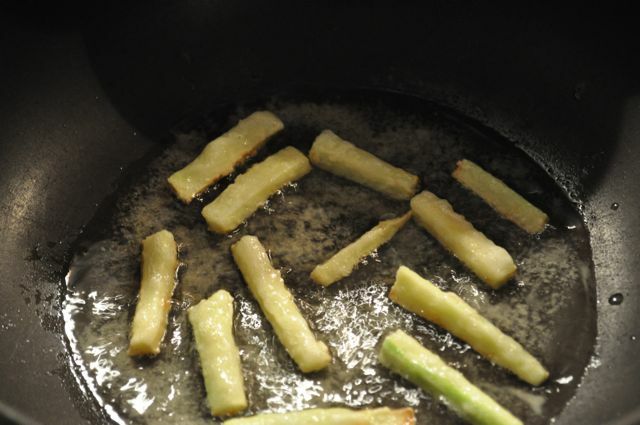 Drop a handful or so of matchsticks into the oil and fry until golden. Remove then fry remaining matchsticks in batches. because kitty cats like zucchini matchsticks too. 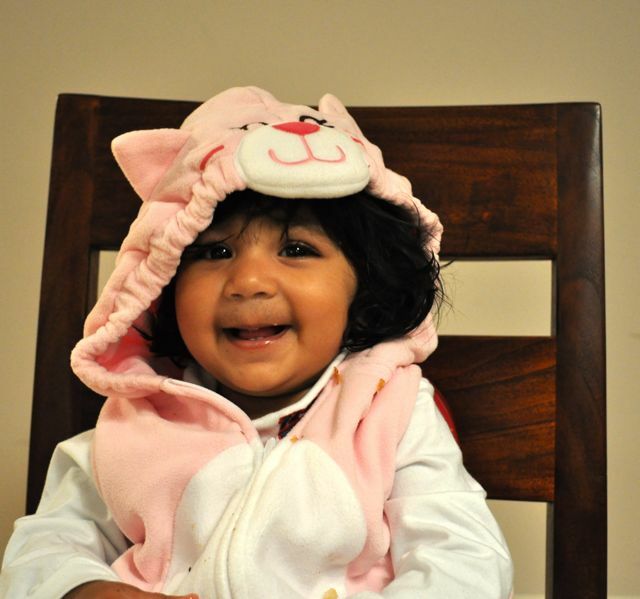 ahhhhhhh… She’s adorable. You have to take one meal at a time with these kids.. very highly unpredictable. Adorable babe!! Good idea with the zucchini. Soooooooooooo Sweet! Its hard for her when she teething. Mine just lost her first tooth. oh she is adorable I hear ya on the ping pong thing!! Nithya, I just found your blog and it’s amazing. Love your photographs, your recipes, and your daughter is so beautiful. I think she and I might have the same taste in food, because I love anything deep fried – even zucchini. Hope all is well! Haven’t been by in a while. What a cutie you have there! And a girl after my own heart, loving fried zucc.